The NFL’s regular season might be over, but there are still games to be played at Fanduel. Wild Card Weekend is upon us and the Footballguys Staff has laid out their lineups for you to take a look at. Subscribers can check out all the lineups here, while I’ve cherry picked some things which are worth discussing more in depth. With less players to choose from at quarterback (just eight), the staff largely went with the more expensive plays. Russell Wilson ($8600) and Ben Roethlisberger ($8400) were the most common two. There were some AJ McCarron ($6400) and Kirk Cousins (YOU LIKE THAT AT $8000) but Cousins isn’t really cheap and is almost chalk in this matchup anyway. Some positions give you more wiggle room with lighter slates than others. Quarterback is not those positions. Nobody is taking chances in their cash lineups with Teddy Bridgewater, Alex Smith and Brian Hoyer. 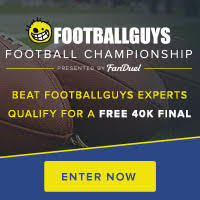 Maybe in a GPP, where you are rewarded for uniqueness, but not in cash where you just need to beat 50% of the field and winning in the last spot and the top spot pays the same. Interestingly, while I personally think there is almost as little wiggle room at running back as there is under center, a lot of the staff went the other way. Granted, chalk at this position is Adrian Peterson and maybe Marshawn Lynch (if he plays), though an argument could be made for Charcandrick West. But a lot of the staff took some chances. They grabbed either Jeremy Hill or Giovani Bernard (who are splitting carries), Pierre Thomas, Jonathan Grimes, Matt Jones and Alfred Morris. It makes sense though, when you look at some of the choices they made at receiver. Many doubled up on Antonio Brown/DeAndre Hopkins or swapped one of the two for Jeremy Maclin. One staff member had all three. Ultimately, I think either way is OK, and both have some risk. For myself, I tend to want stability in running backs this week and take a few more chances at receiver. I took Adrian Peterson and Charcandrick West (along with Russell Wilson and Tyler Eifert) and went with Doug Baldwin, James Jones and Pierre Garcon at receiver. I believe Baldwin will play and overpower Minnesota’s defense, and Garcon will do the same against Green Bay. Jones is my biggest long shot, as he is very touchdown dependent, but I also believe this will be a good week for him. I found it interesting to see I was largely in the minority. While I won’t change it immediately, I do think seeing that will make me look closer at some of the matchups I have and see if I am missing something. That’s always an important part for any fantasy matchup. Where am I deviating from the herd and is it a good or bad thing? Richard Rodgers ($5200) is an interesting choice. I actually think he’ll have a solid game, but he is very touchdown dependent and that makes him risky. On the other hand, aside from Jordan Reed and maybe Tyler Eifert, there are no sure things at tight end this week. A few people went with James Jones ($5700) and a couple others are believing in Martavis Bryant ($6900). I suppose you either believe Bryant really took Ben Roethlisberger’s criticism to heart or you think he’ll blow it off. I didn’t go with him because I liked my three guys more, but I am in the camp that Bryant bounces back with a good game against the Bengals. He represents value this week. I mentioned that AJ McCarron ($6400) got a start from the staff, and I can see the appeal since the Steelers defense is shaky. My problem is, the Bengals are not trying to have him do too much. He has only passed 200 yards once since taking over (280 in Week 14 – was right at 200 in Week 16) so while the Steelers defense can be vulnerable I don’t know that I think McCarron – in his first playoff start no less – is going to put up big numbers. Can he do just enough? Probably and he’s likely not to throw interceptions. I’m not sure if I want the risk though.